The Big Windmill is a very large windmill found in Bianco Hills in Super Mario Sunshine. It is the largest windmill that can be found in Bianco Hills, and it is only accessible via a winding path leading away from the small village in the area. In Episode 1, the outside of the Big Windmill is partly surrounded by Brambles at intervals, which inflict damage if touched. Four platforms (one each on the end of the Big Windmill's four huge blades) allow Mario to access the roof of the Big Windmill. The Big Windmill makes an appearance in every episode, but is only of critical importance in a few episodes, including "Down with Petey Piranha!" and "The Red Coins of the Lake." 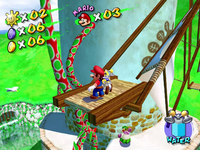 In the former of the two, the player must maneuver Mario to the roof of the Big Windmill, where Petey Piranha awaits. The roof of the Big Windmill then completely collapses under Petey's weight, causing Mario and Petey to fall down into the hollow interior of the Big Windmill, where a boss battle ensues. In the latter, a Shine Sprite appears in a small alcove located on the front of the Big Windmill after the player has collected the eight Red Coins found over the lake. In the Super Mario Sunshine end credits, a photo shows Mario, Princess Peach and the Toads in front of the windmill. This page was last edited on March 7, 2018, at 21:21.